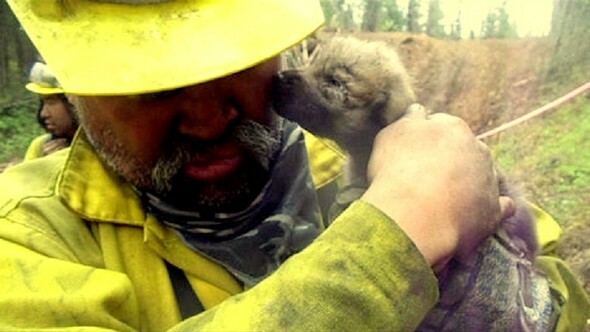 Five abandoned wolf puppies were saved earlier this week by firefighters from a massive wildfire on Alaska’s Kenai Peninsula. They had also been pierced with porcupine quills and would have died from infection and dehydration had these heroes not come to their rescue. Around noon on Tuesday, firefighters battling the northwest edge of the 200,000 square acre fire said they could hear a single yipping sound coming from what appeared to be a den, said Steve Miller, Kenai Nation Wildlife Refuge’s deputy manager. Two days earlier, crews had built a firebreak along a riverbank right where the den was. Miller contacted the Alaska Department of Fish and Game. Local wildlife biologist Jeff Selinger accompanied him to the den. 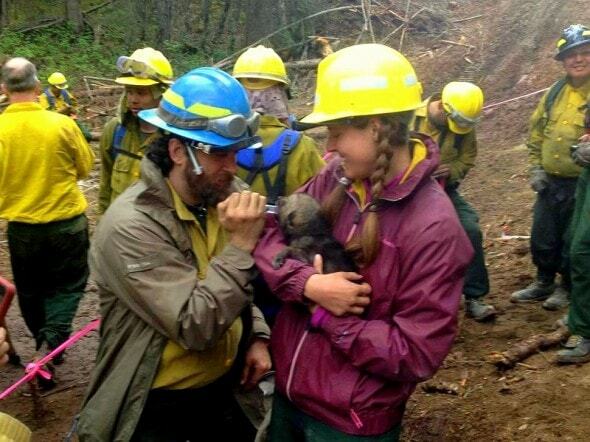 As officials arrived, one dehydrated pup emerged from the den, a porcupine quill spiked in his head. Selinger searched for their parents, but no adult wolves could be found. With the abundance of firefighters and the devastating blaze ever encroaching, their return seemed unlikely. “It was a pretty easy decision for (Selinger) to decide, ‘Hey, these guys need some help,’” said Ken Marsh, information officer for the DFG. But the six-foot tall man wouldn’t fit into the narrow den, which went back about ten feet into the hillside. A smaller man volunteered to enter the den. One puppy was dead, having borne the brunt of the porcupine’s quills, who likely sought asylum from the fire in their den. 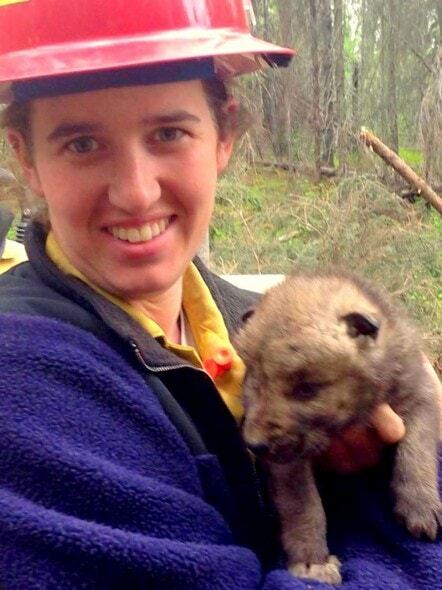 Four live pups were extracted, each dehydrated and punctured a number of times. “They were starting to fester,” Miller said of the wounds. Two fire division medics gave them sugar water to rehydrate them. 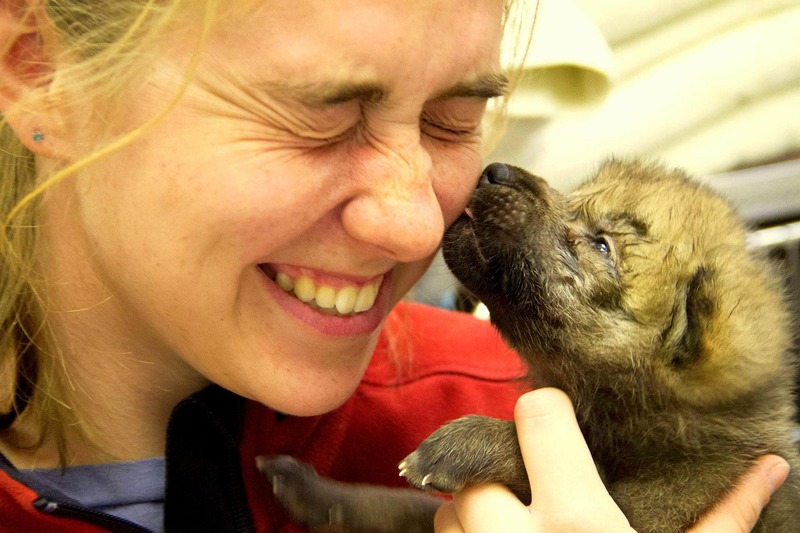 Later in the day the puppies were driven to the Alaska Zoo in Anchorage. They were examined by the zoo’s veterinarian and quarantined. 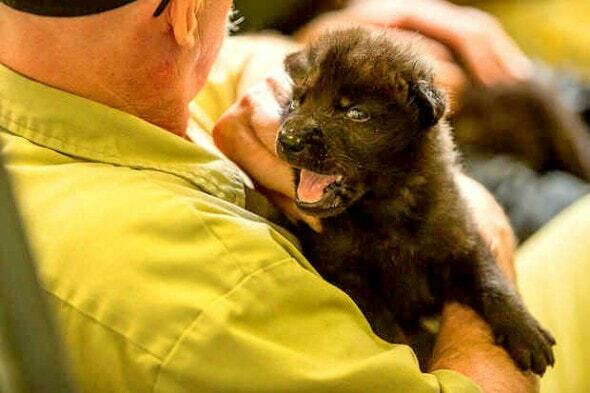 The zoo’s developmental director, Jill Myer, said they’ve been being given puppy milk replacement every few hours. They are only 2.5 pounds each, a half pound less than normal for their two weeks of age. All of the quills that could be seen or felt were removed, and because of abscesses that had developed, some of the pups were put on antibiotics. Now they’re doing well, recovering from their traumatic experiences. 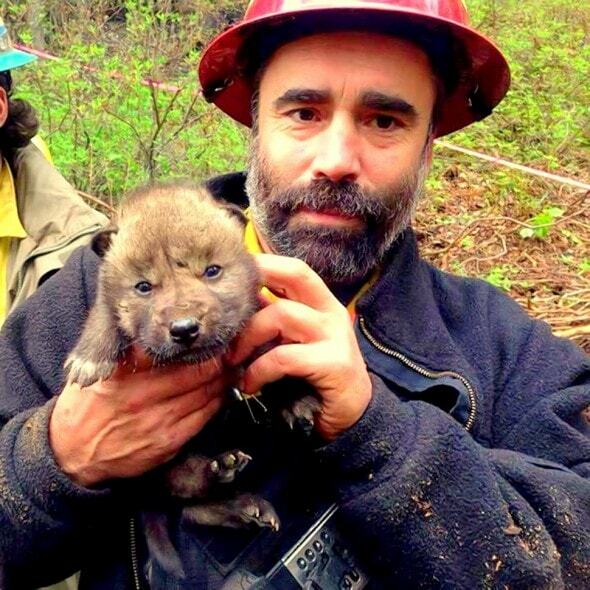 Because they’ve had to be handled by humans, the wolves will not be released back into the wild. 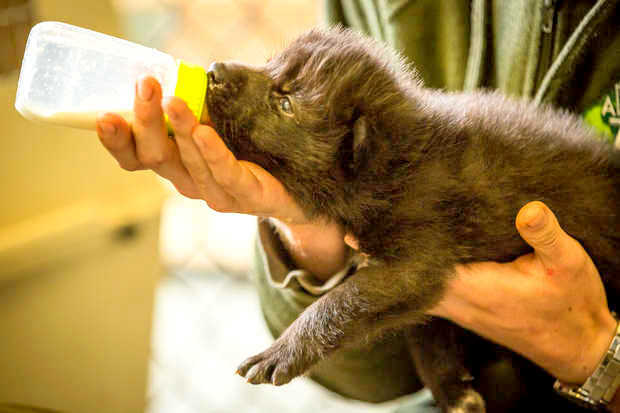 The Alaska Zoo already has a wolf pack to care for, but they will be looking for a good home for the pups. Awwwwwwwwwww XD oh my gosh oh my gosh oh my gosh!!! I soo wish I was that lucky! I adore wolves completely!!!!!! So cute!!!!!!!!! am very well with in humans, they are greater and are more loyal than human, can give credit for. I am interested, in mastiff’s, wolves, pits, chow, horses, any and all, I have broke 3 stallions, out of 5 horses, I have had 2 wolves, and had trained many of loyal companions, that others would of put down.. I wouald love to ear more about you, and how we may be of use to each other, I have a big hert for animals, I had 4 males all at once, no troubles, love is the key..i am on a farm area, and am loney, for more that I may do to aide im living and loving while conserving.